Because it’s still mostly dark when I get up and dark again when I get in from work I have to do my feeder-watching in stolen moments when I should be paying attention to other things. This oriole very nearly made me late for work this morning! 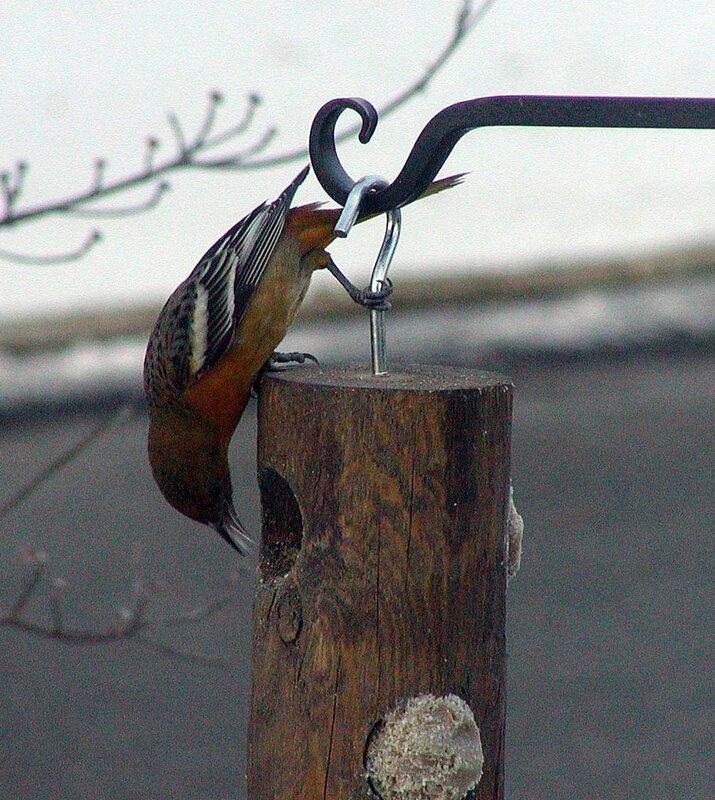 I’ve never drawn an oriole to the feeders, most certainly not in January! 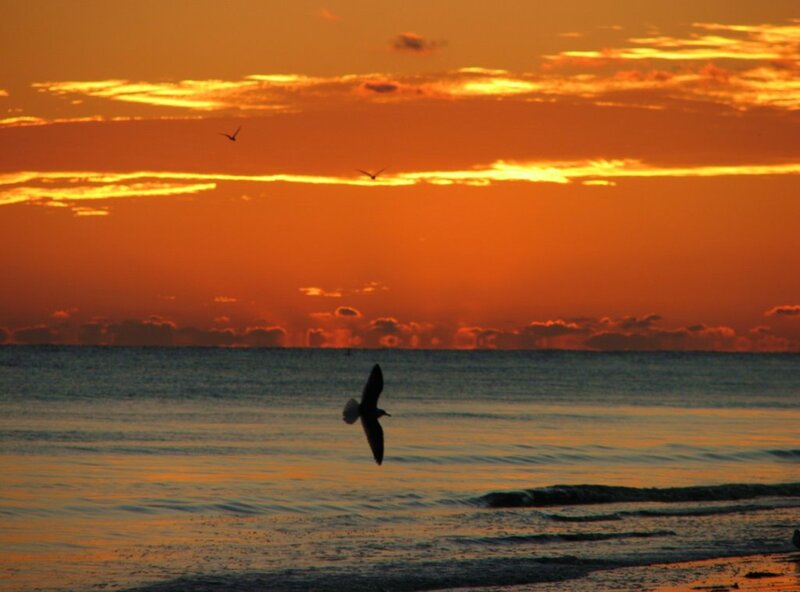 This bird should be down Mary’s way in North Carolina. It was still darkish when I took the photos and that top one is through the window screen as well, but I guess it must be a Northern Oriole, because Orchards should be real far south in Florida now. If I saw this bird in the spring I would call it an Orchard, though. 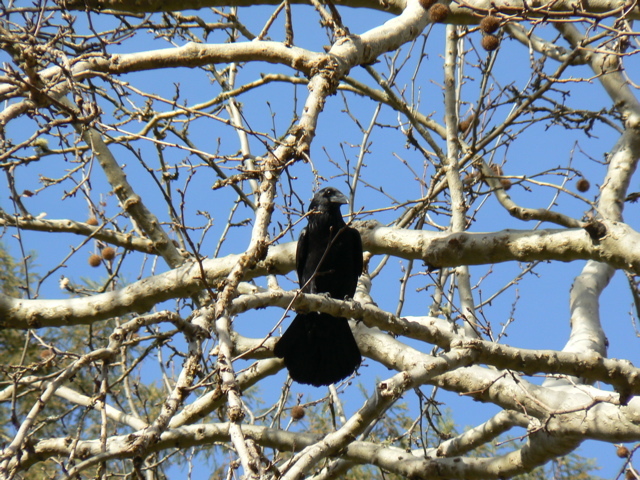 But I’ve never been good at identifying birds in their in-between plumages. Maybe someone can help? Would one of you bander folks that check in here be able to help me out with some ID tips? In case you’re paying attention to that *What I’m Reading* thingy over in the sidebar – I’ve finally updated it. I can’t really call what I’ve been doing lately *reading* – it’s more like perusing 5 different books at the same time – but I’d left that book about the Pine Barrens up for months after I finished reading it actively because quite a few folks have clicked on it. I’ve replaced it with another of Joanna Burger’s books that I *read* years ago, but now I’m just *perusing* for ideas and some inspiration on where to spend my free time. It’s a good book and one that I think most anyone that lives near the shore would enjoy. The other night I read about the Brant that winter in Barnegat Bay here in NJ (approx. 50,000 according to Burger) and how they prefer to feed on eelgrass, but if that becomes unavailable due to ice, they’ll switch to sea lettuce that grows along the margins of the marsh. 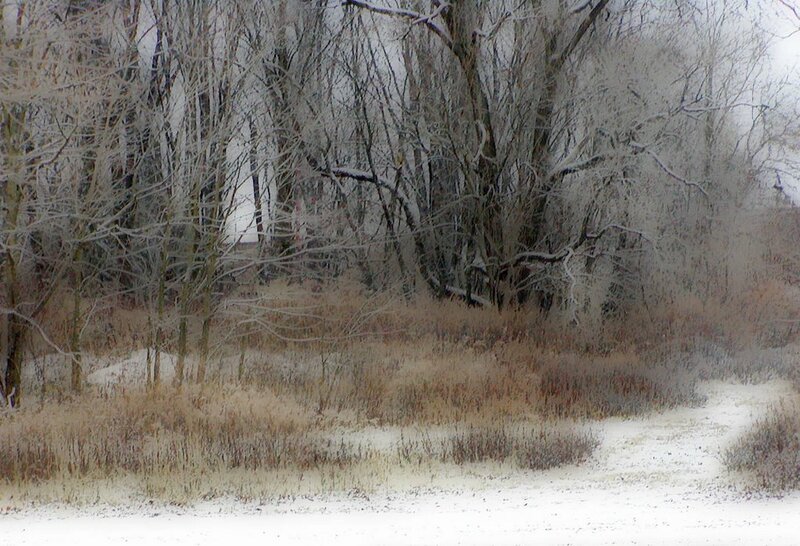 If the bay freezes and the ground is snow-covered, often they are caught by surprise and many will starve. But… why not just fly farther south? 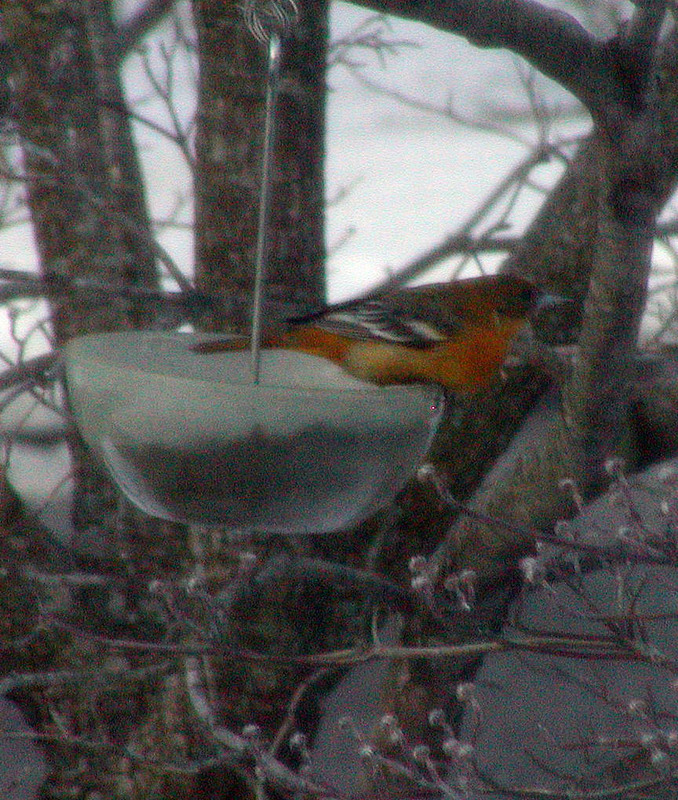 Why is the oriole I saw this morning hanging around here where the weather is suddenly cold and snowy? Why not just go? Anybody know? This story touched me today. I’m not sure why it should; I don’t know anything about racehorses, other than enjoying the ones I see boarded and pastured locally. There’s two racetracks nearby to my home, but I’ve never been to see a race and don’t gamble anyway. For a few years when I was first married I used to like to ride my bike across the river and past the stables where the racehorses are kept. In the very early mornings sometimes I would see them out being walked and the sounds and smells of the stables marked the half-way point of my ride. 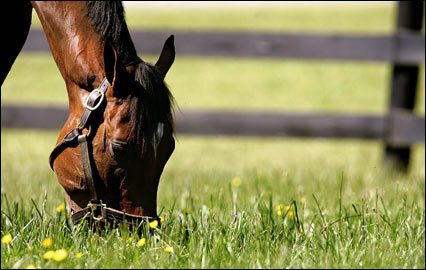 I hadn’t been following Barbaro’s recovery, but was reminded of him this morning when I heard a somewhat-hopeful-sounding piece on NPR on my way into work. By lunch time I had heard that he was put down. It came as a shock considering what I’d heard just a few hours before. From the reading I’ve done this afternoon it seems as if Barbaro had quite a fan club out there. I have to wonder why so many people can hang their hearts on an injured horse. Racehorses are injured all the time. It seems almost destined to happen when you consider the way they’re bred to have such delicate long legs beneath an oversized frame. And trained and raced so hard when so young and still growing. It seems like such folly that we should be surpised when one’s injured doing what they’re born to do; to run for the sake of our entertainment. I think his owners are to be commended for giving him the chance to recover against impossible odds and I’m glad that his vet had the compassion and the courage to put him down before his condition got any worse. 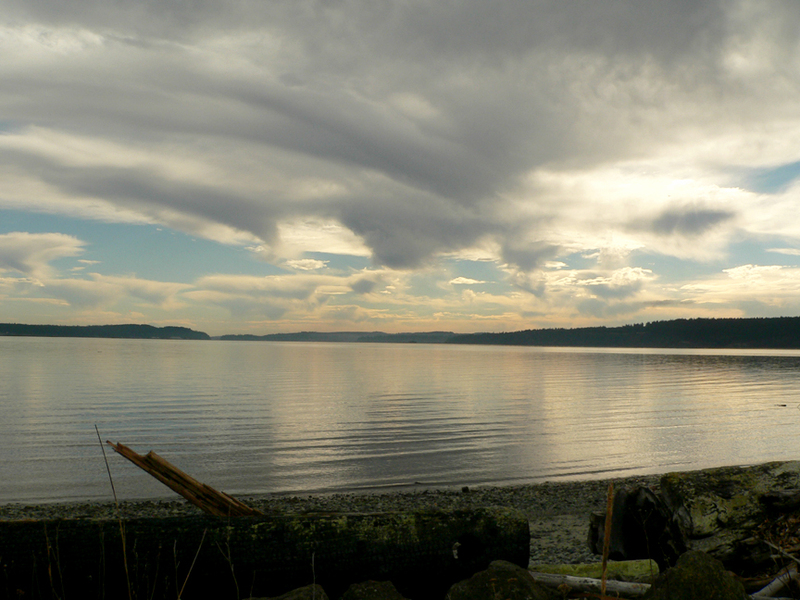 I headed out of the house late this afternoon with scope and camera and no real plan about where I might end up. I was hoping to find the large rafts of scaup and goldeneye than I’d heard mentioned on the bird hotlines; the river had begun to freeze during the last few days of cold weather so I thought they might be hanging out in the bay, but there were only the usuals there. I know of one other spot on the river where large groups of scaup often settle and set about trying to get there. The problem is access. While I live in an area surrounded by rivers and marshes and the ocean, it’s near impossible to get to any of them because of the multi-million dollar homes that line the shores of every waterway. I swear those views are wasted on the wealthy! We commoners have to settle for the view from the one public dock along the river or the bridge that spans it, but of course the ducks were nestled in that little cove beneath the castle on the far shore. The dead end street that runs beneath some of those mansions on the water is often a good place to see ducks close, but when I finally found my way there today and got ready to set up my scope – along came two fire trucks with sirens blazing, followed by a few police cars, and then the blue-light yahoos and off the ducks went to the far shore of the river. But I did have this view from the day – from the bay side at Sandy Hook with the company of gulls and a few cold fisherman. 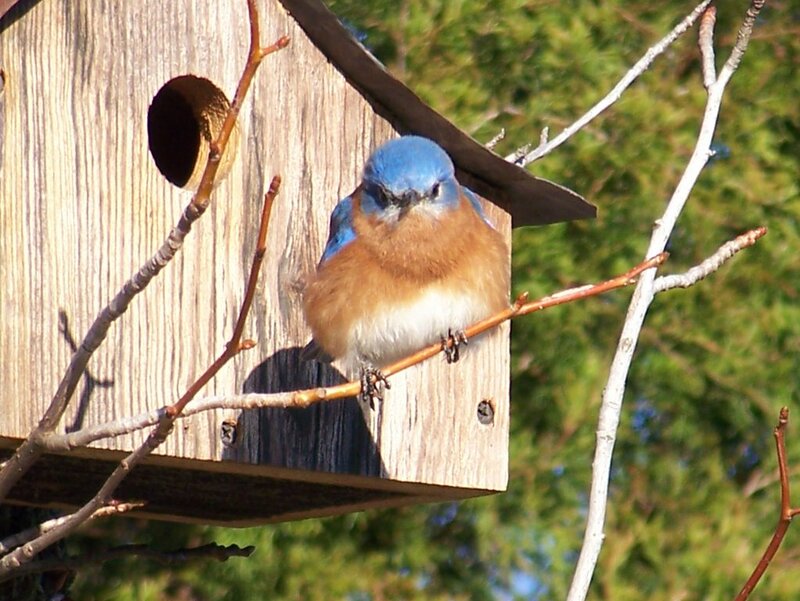 It may only be late January, but the bluebirds have Spring on their minds. Mary sent this lovely photo of a bluebird who was thinking about setting up housekeeping on the college campus where she works in North Carolina. 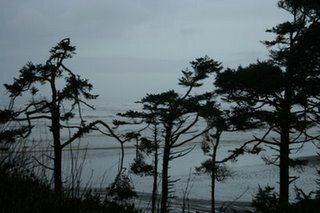 Sarala sent this photo of trees overlooking the Pacific Ocean near Pacific Beach, Washington State. Even though Liza calls her blog Egret’s Nest, she has an affinity for the Ravens that frequent her neighborhood; she especially likes the way this one has fanned out its tail. 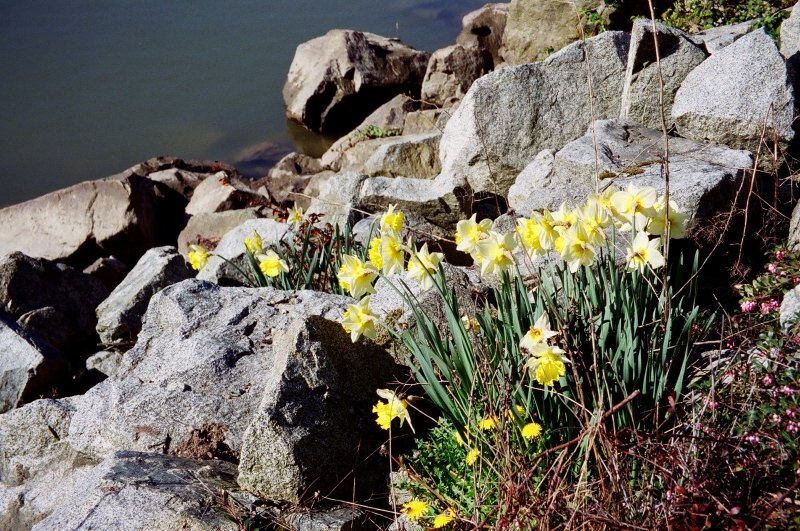 Next month’s Good Planet host Susannah of Wanderin Weeta sent this photo of Spring daffodils, gone wild among the rocks at river’s edge. 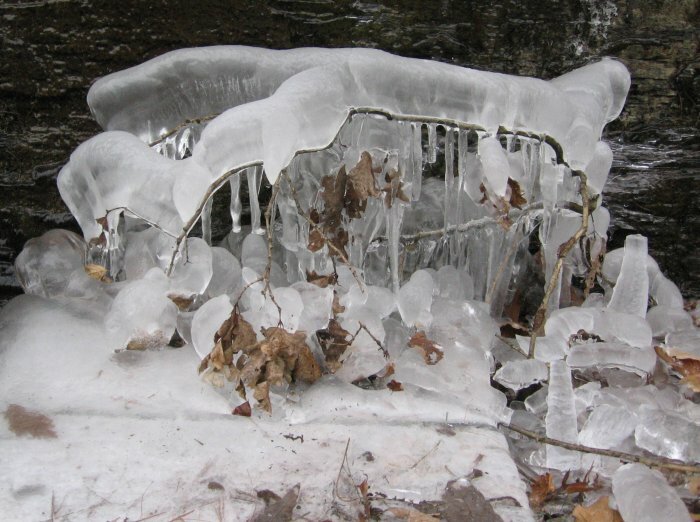 John at A DC Birding Blog shares this photo of ice formations at the eastern approach to the Paw Paw Tunnel on the C&O Canal in western Maryland. 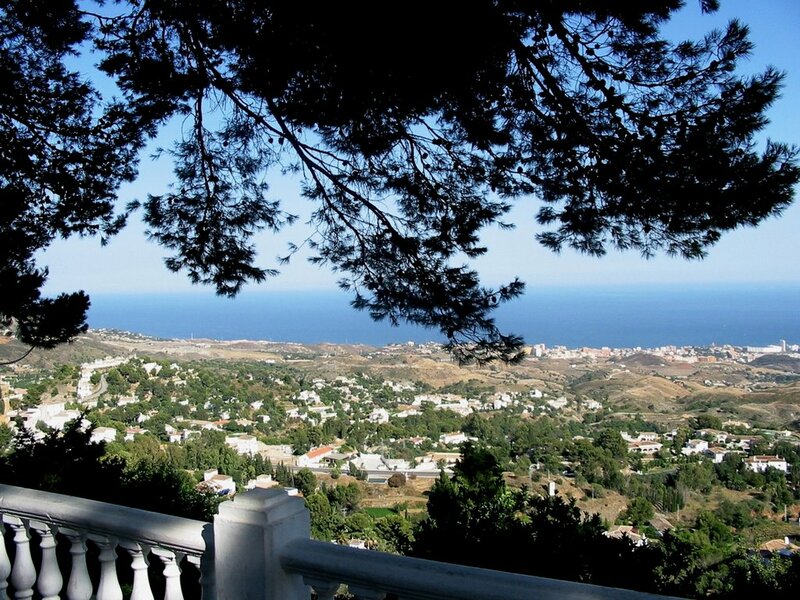 From ice to the sunny coast of Spain – KGMom sent this photo overlooking the Mediterranean in Costa del Sol. 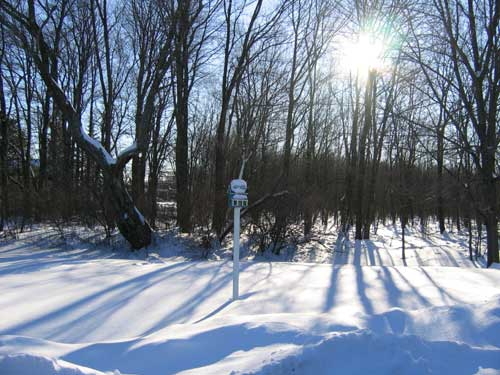 Cathy at Left Curve shares this snowy winter scene from her hometown in New England. 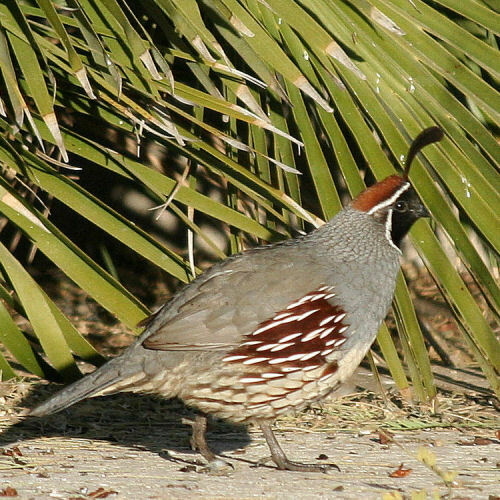 Pam at Tortoise Trail sent this photo of a male Gambel’s Quail by special request of the host. Aren’t they just the most handsome of birds? 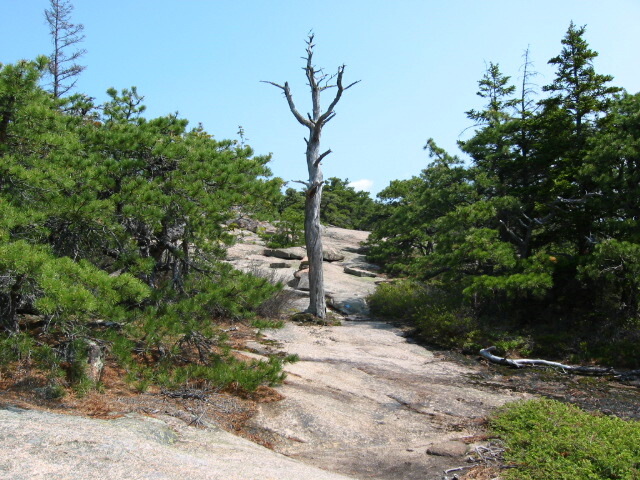 This image of a bare, wind-gnarled tree on Cadillac Mountain in Acadia, Maine was sent by Ann – aka Bunnygirl- from Diary of a (Slow) Triathlete. For all the starkness of winter, their is delicate beauty also. 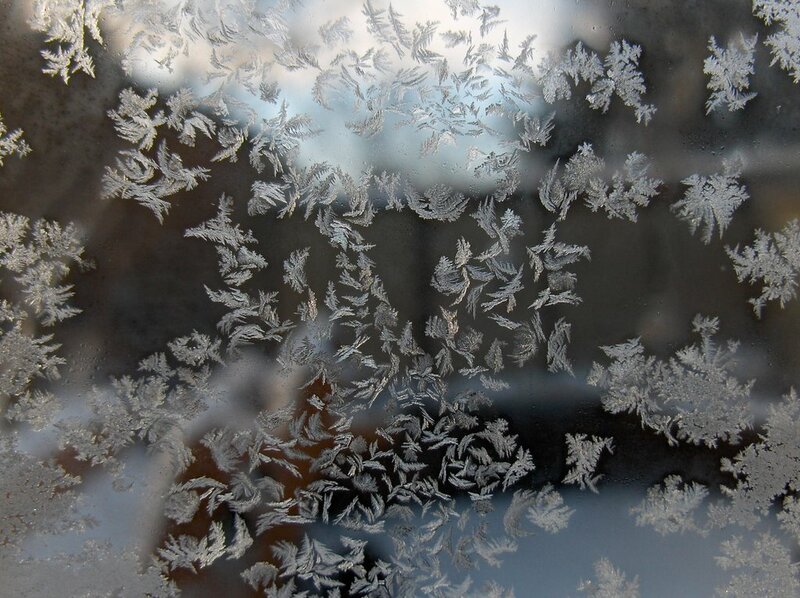 Ruth at Body, Soul, and Spirit sent this frosted vision that the night had left on her windowpane. 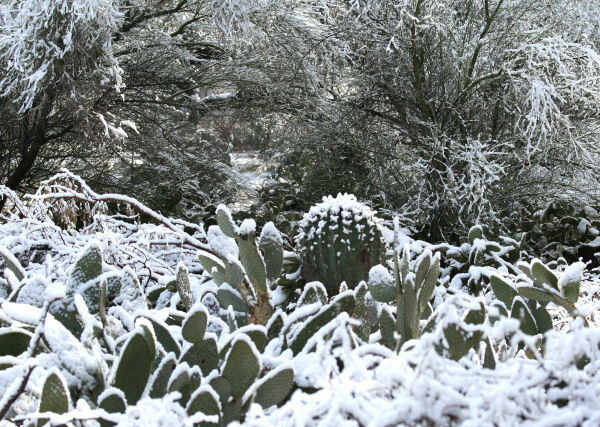 Pam at Tortoise Trail also sent this study in contrasts: desert flora (barrel cactus, prickly pear, palo verde trees and fallen mesquite branches) after Arizona’s rare snowfall of January 21. Hosting these last few weeks has been great fun and an inspiration for me. I hope you might consider giving the Good Planet show a home at your place for a month sometime. Next Saturday, visit Wanderin Weeta for your weekly dose of the Earth’s majesty. Send your photos to susannah AT dccnet DOT com. Remember that all previous photos are archived at the Good Planets flickr gallery. Many thanks to all who submitted photos this week and throughout the month. Please continue to be as generous in sharing the beauty you find around you. I came home from my brother’s this past weekend with a humongous tub of family memorabilia that had been in storage since we sold my dad’s house after he passed away. I’m having a good time going through all the old photos that I haven’t seen for quite a few years. Most of the stuff in the huge tub had been kept forever in the bottom of the china cabinet in my dad’s dining room – that’s where my mom always kept the baby albums, homemade cards from us kids, the report cards and graduation certificates and all the other stuff of a family’s memory. My brother being the pragmatist (and the one paying the bill for storage) has decided that we need to finally figure out what to do with the things we haven’t been able to bear to throw away or to give away. None of us has the room or the need for a dining set, or two bedroom sets, or another side chair and end table. What do we do with these things that we grew up with; what do we do with the sentiment attached to them? Throw it away? Give it away to some faceless stranger that has no sense of the lives and stories that are a part of each piece of furniture? Will the little girl who ends up with my canopy bed care about the dreams that visited me in that bed, or how I used to hide beneath it when my parents had an argument? Will another family share Thanksgiving or Christmas dinner over our dining set and know how my mother loved that table or how my dad re-tooled it in later years as his computer desk? Do these memories matter to anyone but us? Of course they don’t; they’re just things after all. But knowing that doesn’t help with the feelings of guilt. My mom liked to pose photos like this one, with us lined up from eldest to littlest. According to the date on the back of the pic I was 3 and Kevin, the eldest, 13 and Brian in the middle at 11. 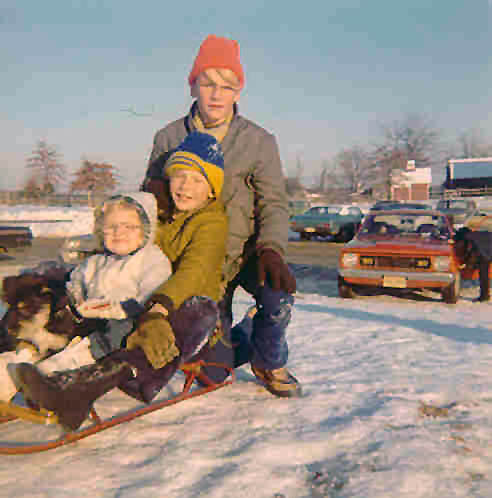 I’m guessing it was taken at Holmdel Park where we used to go sledding and I think the dog may be Rufous (or is it Fritz? ), who I don’t remember but for pictures of him. So I got this nice closeup lens for my camera from Santa. 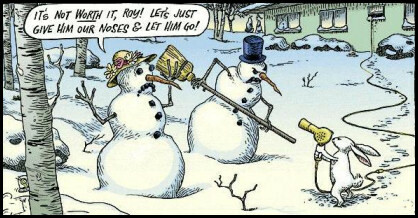 Only there’s no flowers or bugs for me to practice on. And I do need lots of practice. It’s a fixed-length lens, which means that I have to move, rather than the zoom moving in and out. There’s also a really, really narrow range of focus. So I’m taking these oddball pictures of rabbit parts and still life shots of the clutter on my bookshelves until the garden wakes up. Most of these pics remind me of those puzzles that used to be in the back of magazines that would show an ordinary object magnified 50 times until it was unrecognizable. Remember them and how you had to guess what it was in the photo? Last call for photos for this Saturday’s edition of Good Planets. 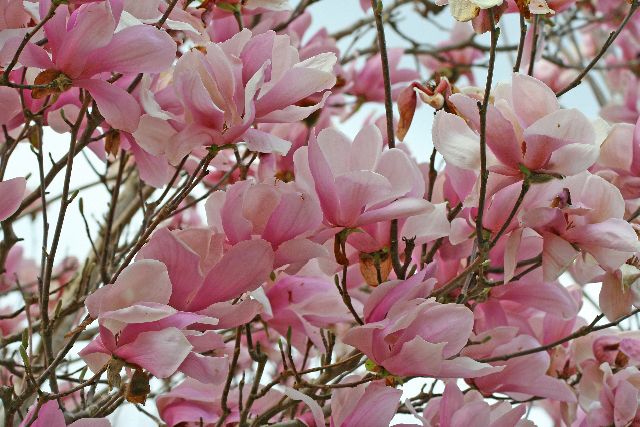 Email your beautiful pics to me at lc-hardy AT comcast DOT net by sometime on Friday. This is the last time that Good Planets will be appearing here, as it will have a new host for the month of February. Don’t miss out on the chance to participate! 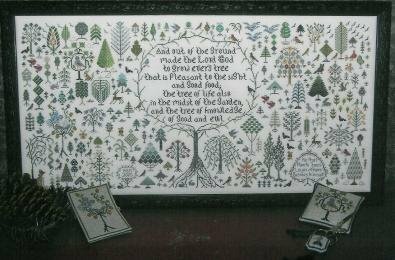 I tried finding a photo online of the cross-stitch sampler that I would like to do and came across this one which is a fairly close match. The design style is very similar, but the one I have is about half the size. I photocopied the chart out of a 15 year old embroidery magazine and went to the craft shop and bought the linen and floss before really thinking about the hours of torture this design on 28 count linen would require. It’s probably been 10 years since I bought any new projects and my eyes have changed in those years, for sure! I simply can’t do it – can’t see the holes in the fabric to know where to put my stitches. I may try the design on a 14 count evenweave fabric instead, but I don’t know that I will like the results so well. What makes embroidery on linen so nice to my eye is the level of detail that’s possible and the variety of stitch shapes that are possible when stitching on a fabric that has a little *give*. Every stitch on evenweave fabrics looks the same and that takes some of the charm away. 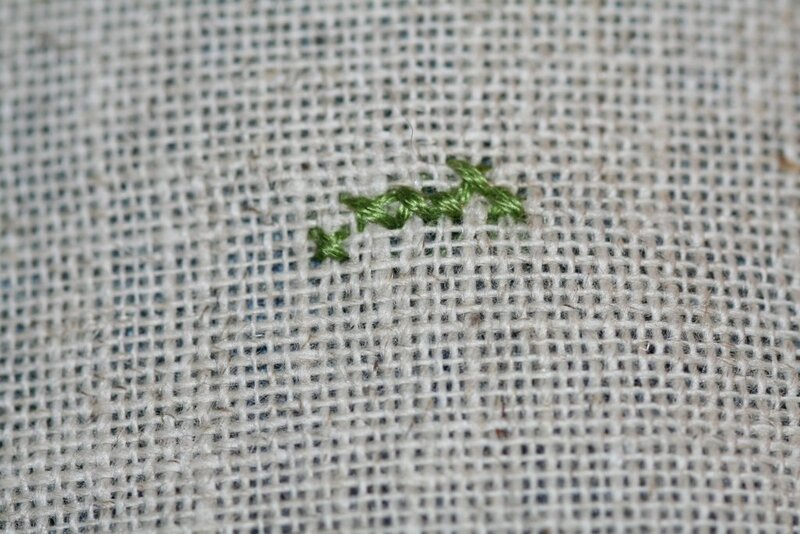 If you’re not a stitcher and don’t have a clue why I’m going on about how tiny 28 count linen is – think of it like this – I’m stitching over two threads in the linen – so on a 28 count piece there will be 14 stitches across and 14 stitches down in an inch – a total of 196 stitches in a square inch of fabric! The design I’m followin g is about 18″ by 15″ so that’s how many stitches? Anybody want to do that math? I did 6 stitches last night and decided that I’m out of my league. 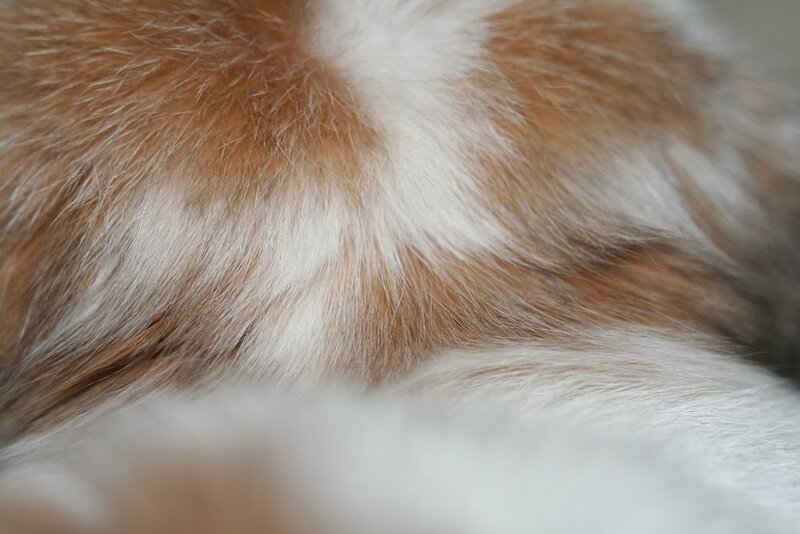 I took a photo of my handiwork with the macro lens and only then did I realize that I made a mistake already! See that last stitch on the left in the bottom row – I crossed it in the wrong place. I could get one of those magnifying glass things they sell, but I don’t think that will make stitching any more enjoyable for me. I need to stick with the big clunky stitches that I can see easily. I’m going to spend a few idle hours this evening with a new cross-stitch project that I bought the materials for on Friday night and haven’t looked at since. You know how on Friday night with the whole weekend ahead anything seems possible? Well, here it is Monday evening and the fabric and threads and chart are still sitting in the bag where I left them at the start of the weekend. 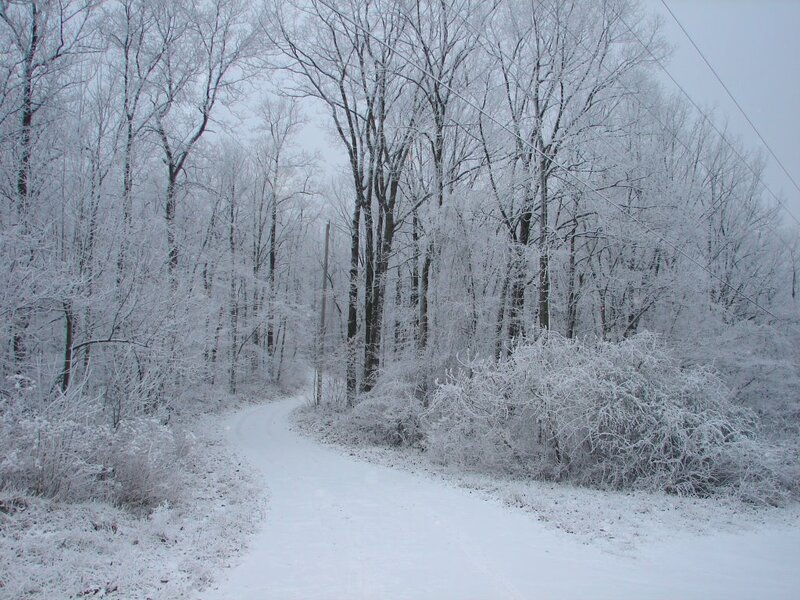 We had a dusting of snow overnight. Not enough for my husband to be called in to work to plow, but enough to make the everyday scene above look a little special, to me, at least. This is a tiny wooded tangle that separates my office building from the police academy that is situated behind the slight incline and closer to the road. I want to believe that a pair of Red-Tails nest here, because I see them perched in these branches so often, but I’ve never been able to spot their nest. Walking in the woods or along the beach at any season reveals an endless variety of forms. Nature is full of delicate colors and intricate shapes – the mosaic of a butterfly’s wing, the coordinated movements of a flock of birds or school of fish, the patterns of seashells, the architecture and symmetry of a beehive. These patterns in nature captivate the naturalist and photographer in me. To those with an inquisitive mind, not content to just gaze in wonder, nature’s complex patterns may provide the added appeal of mystery surrounding artistry. Vicki left that quote on the comments to this post a while back. Also in the comments to that post, my brother Kevin made reference to the idea of the divine in nature which he reminds himself of by displaying a few found objects from nature on the shelf in his cubicle. 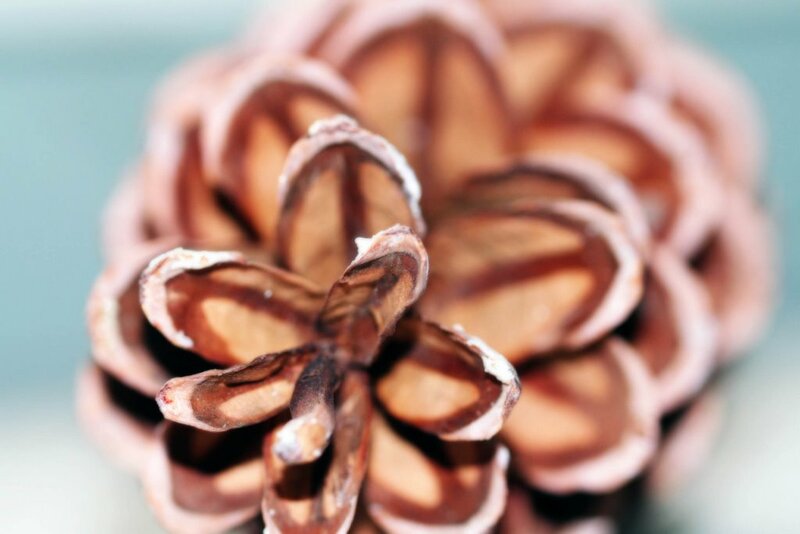 He sees similarities in all apects of nature’s design and believes that if you can’t find God in a pinecone, you won’t be finding Him in church. A co-worker of mine also likes to display found objects from nature in her cubicle. She is a budding naturalist (whether she knows it or not, Linda!) and rather than seeking the divine in nature, I think the variety of co lors and textures are what most appeal to her. 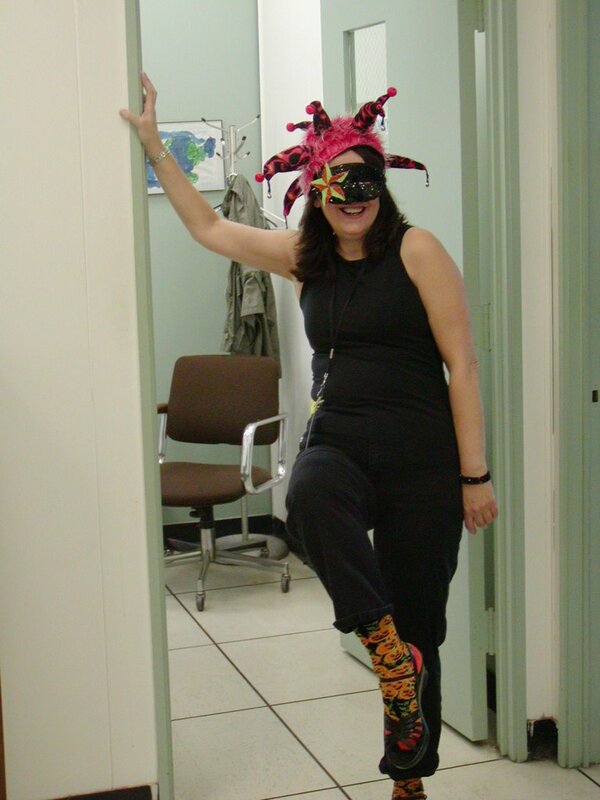 Linda is the Martha Stewart in our department, and generally serves as cruise ship director and party planner. She’s good at what she does. She loves baking and interior decorating. She’s also a bit…. I would call her ditzy, but that might sound mean… let’s say instead that she is easily distracted. Vicki did a post about a particular food channel celebrity which contained a description that I think is hilarious and that I like to apply to Linda when her social tendencies are particularly annoying to me on a Monday morning – Linda prides herself on her advanced degree in tablescape architecture. (You’ll just have to go and read Vicki’s post before you’ll understand the reference – go ahead, I’ll wait ’til you’re back). So the other day I picked up the pinecone you see above from Linda’s cubicle-top menagerie. Turning it over and round and round in my hand I noticed the pattern and turned to Kathy, who God-Bless-Her-Sits-Next-to-Linda, and remarked that it looked to me as if someone had actually taken a sharpie marker and drawn the design you see on each of the scales. Linda was only half-listening at this point, which is her usual state with any conversation. Kathy wondered aloud that anyone would go to the trouble to do this and I said that I thought that, yes, someone had actually gone to the trouble to design it that way. “Really?” Kathy asked. (Kathy and I talk this way all the time – on the surface very mundane, but we both know what we’re really discussing). “Sure,” I told her, “that’s divine design at work”. At that, Linda’s ears perked up. If we keep our minds and hearts open to it, nature’s creations may delight the imagination and challlenge our understanding of the world around us. How do these patterns develop? What rules or guidelines shape the world we live in? 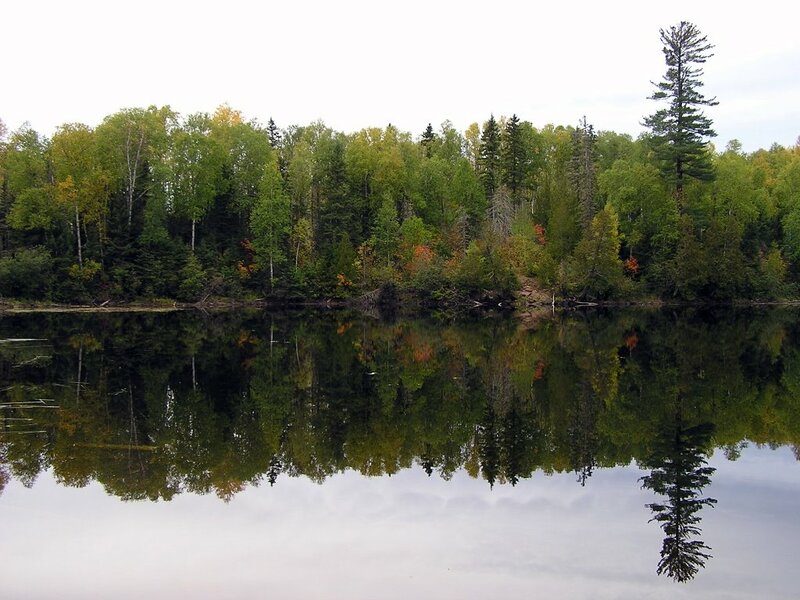 What draws you to nature – the mystery or the artistry?